Long (28513) 'pictogram' formation in barley, with extensive adjacent areas of randomly- downed crop, found along Rt. #89 in the Cache Valley area by local pilot. 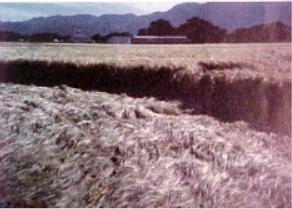 Photo below right shows flattened crop in largest (95' diameter) circle. Photos: Con Olsen. July 22, 1998. Formation Characteristics: A large (95' diam.) circle connected by a 74-long path to a (46' diam.) circle circumscribed by two arcs, with an additional 68'3"-long path and two unattached 30' diam. circles. The arcs and both paths are all 4' wide; overall length approximately 285' 3". Large areas of randomly-downed (chaotically-downed) crop occurred adjacent to the more geometrically-flattened circles and pathways (see fijgj 1, 2). Note: following collection of the field samples Mr. Nielsen found a semi- liquid "green substance" adhering to the side of his car which he sampled with Q-tips. 1. 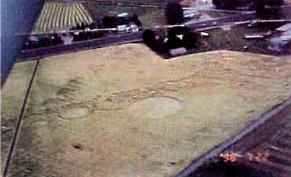 Increased amounts of magnetic material were found in the soil of the four circles. [The highest amount of magnetic material which might be expected in "normal" soils is 0.4 mg./g-soil; here we foUnd average amounts in the individual circles as high as 1.8 mg./g-soil.J Microscopic examination revealed characteristic ovoid and rounded magnetic particles similar to those frequently found in crop circle soils, with surface characteristics typical of magnetite. C and 0, respectively (the two 30'-diam.circles). 7. No expulsion cavities were noted. A total of 94 plant sample and control sets (approximately 14 plantslset) were measured for node-length change (ffj~. 3). In addition, 94 soil samples and controls were subjected to the magnetic drag test to determine content of magnetic material in the soils. With the exception of Circle B (the 46-diameter circle, to be discussed presently), there was no evidence of selective node-length changes or grouping of magnetic particles. When the mean values of the node lengths (NL) and magnetic material for each circle were compared a roughly linear relationship was found (ffjg. 4). In most crop formations we find that the levels of magnetic material are higher in the soils at the perimeter and immediately outside the formation than they are in the soils inside, a finding explained by considering the physics of the forces on particles within a rotating vortex. In this case we found higher levels of magnetic material inside the formation, suggesting that the vorticity or angular momentum was not sufficient to distribute the bulk of the magnetic mateiral outside the formation edges. Further evidence for a low degree of angular momentum was provided by the data from Circle 8. Here we discovered a pattern of node-length change which altered quite drastically along specific sampling radii. On the NW and SW radii the node-length increases were found to be +38% and +50%, respectively, whereas along the NE and SE radii the node-length changes were -9% and -11%: in one half of Circle B we note significant node-length increase and in the opposite quadrants a node-length decrease. In the laboratory we have found that when plants are exposed to microwave energy for a prolonged period of time, there is a decrease in plant stem node-length. In other words, it appears that the microwave energy in the eastern half of Circle B was applied over a much longer interval of time than in the western half. This partitioning of energies within the hypothesized plasma vortex energy system is in line with what we would expect in a thermodynamically unstable system operating under the principals of chaotic self-organization. A microscopic examination of the green substance found on the side of Mr.Nielsen's car revealed the presence of extremely fine, spherical particles adhering together; particle sizes ranged from 1.9 to 3.7 micrometers in diameter. The spheres were solid, rather than hollow, and insoluble in water. Under a microscope converted to accommodate a UV source, each tiny bead appeared to fluoresce very strongly in the green region (5g. 5). SEM (scanning electron microscope) photographs show these beads to be very spherical and very uniform in size and the EDS (energy dispersive spectroscopy) disclosed high peaks of Al (aluminum), Si (silicon), Mg(magnesium) and Ti (titanium), plus a carbon peak which is felt to be contamination on the outer surface of the beads (Fjg~. 6, 7). In general, the EDS indicates an aluminum silicate glass, doped with titanium. In normal sunlight UV radiation would cause the spheres to fluoresce, thus accounting for the green color noted by Mr. Nielsen. The distribution patterns of the changes in plant stem node length, in conjunc- tion with the levels of magnetic material found in the soils in this formation make it quite clear that the plasma vortex energies were involved in the creation of this crop circle. The presence of the fluorescent glass-bead material remains an unknown factor. rewritten, or redistributed. & can only be reproduced with expressed written permission. We Thank Nancy Talbott of BLT Research for this Utah Crop formation research report sent to us on 02/02/2002 and the detail and effort put into it.